Heavy-duty plastic flooring provides good resistance of the boat on the water. Inflatable keel improves directional stability and control. A bit heavy for one person to carry. High reliability of design allows you to apply a high power motor which can provide extremely fast speed. The best ratio of versatility, quality, and the price. A comfortable storage bag is included in the kit. The roomy bag for fishing tackle allows you to store all essentials and a lot of accessories. Included oars are not designed for heavy loads. This boat is perfect for a young family. It is good for romantic trips with your loved one as well as for fishing on the lake or in a quiet bay. The model comes equipped with two fishing rod holders. It also includes a couple of grab handles on the bow, in order to provide you with some support structure in case you manage to catch a fierce one that won't go down without a fight. The gear pouch is a bit small. 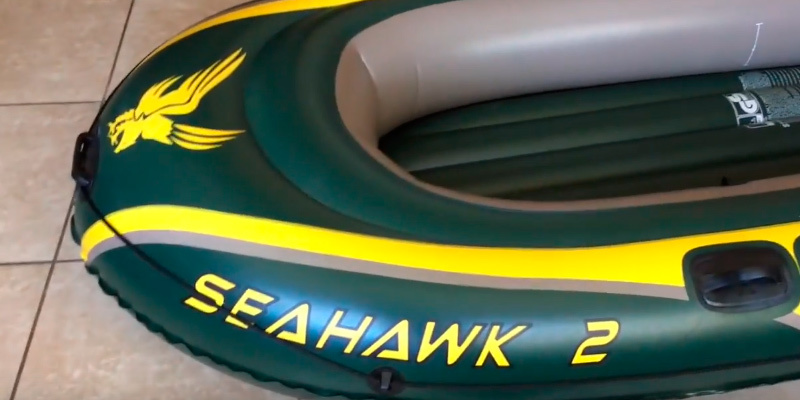 Intex SeaHawk 2 (68347EP) is a 2-man inflatable boat that, despite this little limitation, is arguably one of the best options on the market if you're looking for a reliable model to go fishing with your partner or simply enjoy a nice day at the lake. Seats with inflatable backrests are more comfortable compared to the other models. An additional inflatable pillow can be even used as a table. Included oars are a bit short. Thanks to its dimensions, the boat is perfect for rest or fishing on the lake with a small company of friends. The extra firm vinyl construction is resistant to gasoline, oil, and salt water. 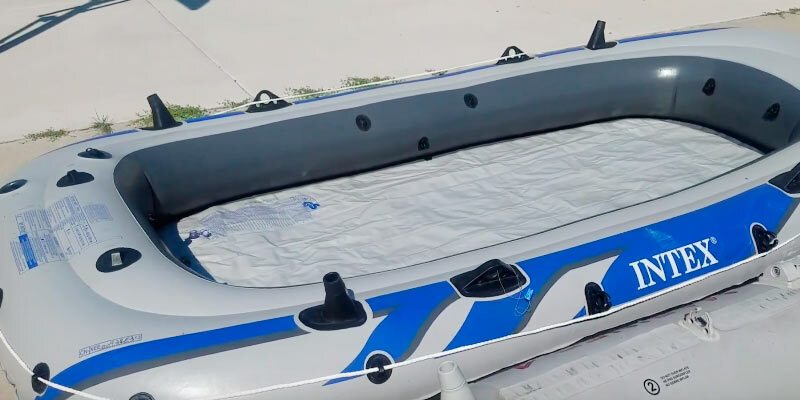 In addition to three regular air chambers, this boat also incorporates an extra inner air chamber for improved floating capacity and an inflatable bottom. There's no option to mount a motor. Though the model is incredibly lightweight, it is also one of the most durable and reliable inflatable boats out there. That, combined with the price tag it comes with, is what makes this product such an alluring option for a variety of customers. 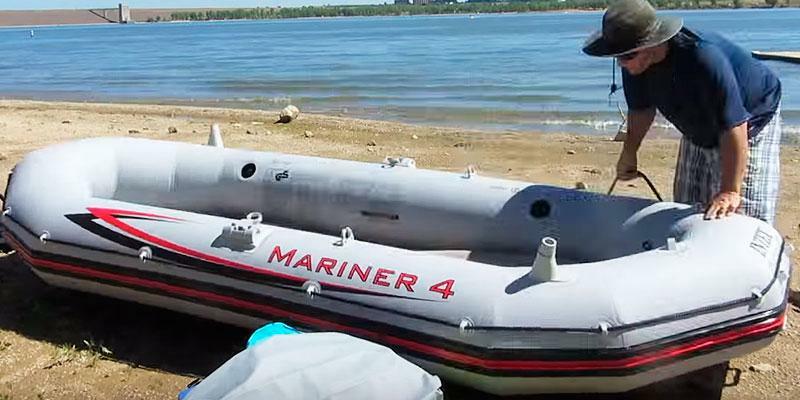 The manufacturer has used modern materials and technologies to produce Intex Mariner 4-person boat! 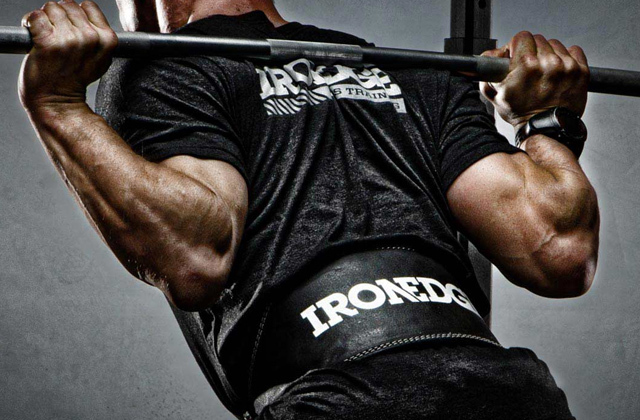 So, it can load up to 880 pounds and hold this weight on the water without any problems. The length of the boat is 129" and the width is 57". It can comfortably accommodate 3-4 people. Consequently, this super boat will allow you to relax with your family on the lake, on the sea bay, or on the calm river. You can also use this boat for fishing with your friends or for transportation of some goods to the other bank of the river. 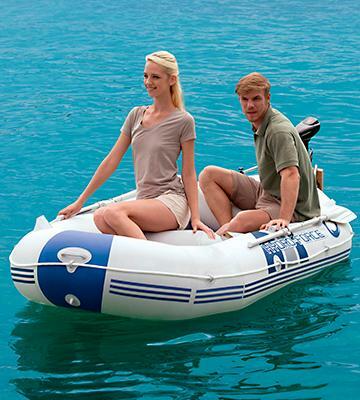 If you are keen on different water activities, you will definitely appreciate this inflatable boat! 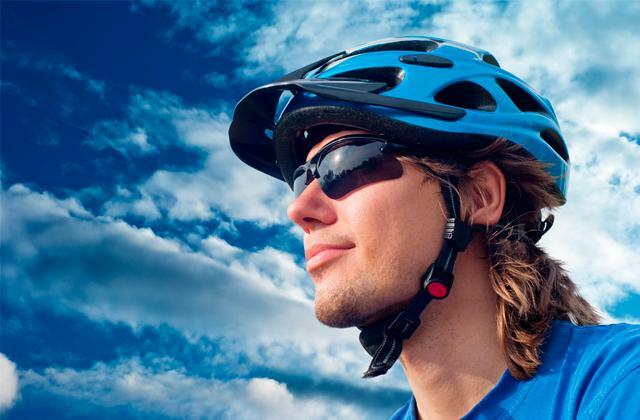 It is made of a strong, three-layer PVC which boasts good elasticity and high resistance to ultraviolet. Moreover, 4 separate chambers make it possible to maintain the buoyancy of the boat, even if one of them is punctured. Each chamber has a Boston valve which can hold the air inside reliably and deflate the boat really quickly. 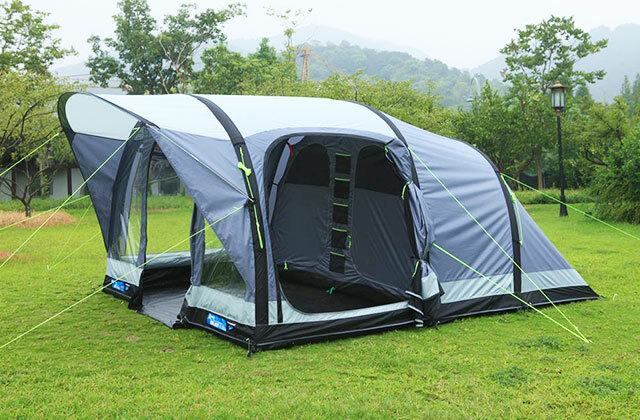 The floor is made of plastic which provides good stiffness and allows you to stand inside comfortably. The inflatable keel significantly increases stability and controllability. If necessary, you can easily install a small motor. The stock is running out! 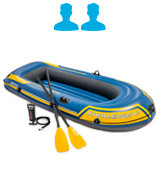 Don't miss a chance to get this super rubber boat! You can place everything and everyone on this boat! Intex Mariner is equipped with three inflatable seats with cushions which allow you to place all of the passengers with comfort. There is also a gear pouch for storing the motor batteries or your essentials, which will protect them from the sun and water. Two rod holders are located on different sides, ensuring a comfortable fishing trip for two people. What's more, the boat also has a special pouch for fishing tackle to keep all the essentials at your fingertips. This boat is equipped with two swivel oarlocks which perfectly hold the oaks. And you can use the boat just after unpacking because two oars and a pump are included in the kit. Super! Do you and your family like to spend time together? 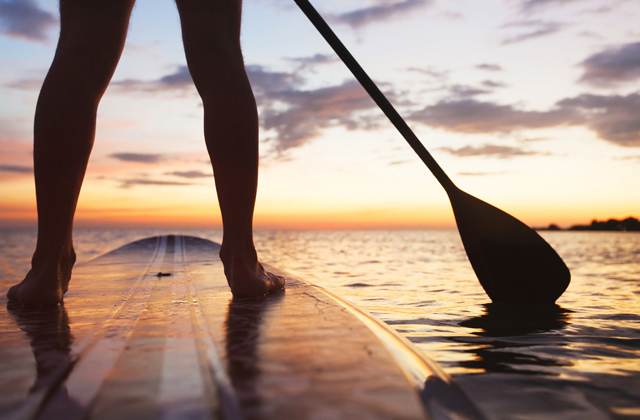 The best option is to spend time on the water! 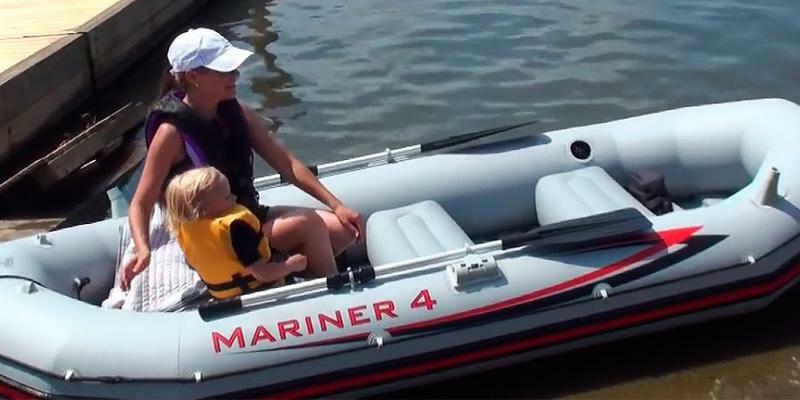 Bestway Hydro-Force Marine Pro is the boat for young families. It is designed for sailing on calm water or on the sea bay. The length of the boat is 115", the width is 50", and the maximum load is 594 pounds. 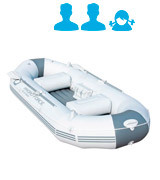 These parameters allow the boat to accommodate two adults and one child comfortably. So, the boat is perfect for a family rest at the nearest lake in the summer. You will definitely enjoy this boat if you like interesting family trips! Like most models, the boat is made of high-strength PVC material and consists of three separate chambers. Two of the chambers are the sides of the boat, and one is the bottom. Thus, you don't need to worry about the safety of your family at all! If one is punched, you can safely get to the bank with two chambers. The sides of the boat are pumped with Boston on-off valve, and the bottom with the standard one. You can find three special holes on the boat for a motor, which will let you move on water very fast. If you like this boat, go ahead and buy it cheaper! The sale is over soon! This model is equipped with a special bag to carry and store this flat boat, two 60" aluminium oars, and a pump. It's self-evident that with such a set, this boat can be used just after unpacking! What's more, two inflatable seats can be removed or replaced easily for you to use the boat as a kayak or just rearrange the space if you want to. To store the additional equipment or fishing tackle, you can find a pouch. The oars are mounted on two swivel oarlocks, which provides comfortable control and easy rowing. During the fishing, you can set spinning or rod in the special holders located on the sides of this amazing boat! 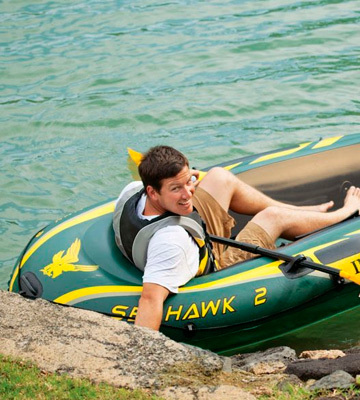 The Intex SeaHawk 2 (68347EP) is an inflatable dinghy that, by its very design, is only fitting for 2 people at the same time. And while that may certainly seem like a rather limiting scenario, the boat is actually as accommodating and flexible as a 2-man model can be. 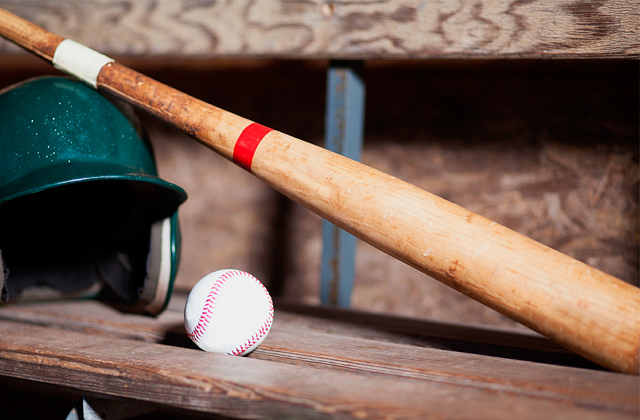 Now, before going into some of the details that make this product such a versatile option, there are some things we will have to get out of the way first. Like we have already mentioned, this is a boat that is designed for 2 individuals to use and that is emphasised in its overall size of 114 centimetres in width and 236 cm in length. This kind of downsize compared to some of the more spacious models doesn't come without its advantages, of course, since the boat weighs only 8.5 kilograms, so you could always easily take it with you without having to worry about some additional weight dragging you down. Furthermore, this 2-man inflatable raft boasts a considerable weight limit of 200 kilograms, meaning you can use this model as a romantic getaway option just as well as a boat to take your buddy on a fishing trip with you. The latter is where this boat absolutely shines, by the way, due to a couple of features that we would be remiss not to mention later. Now, in terms of fishing, the boat incorporates a few things that will certainly make your trip to the lake worthwhile, especially if you're an angler. First of all, the model comes equipped with two fishing rod holders, and we probably don't have to explain to you how crucial those can be when you're planning for a long fishing experience and you'd like to rest your hands every once in a while. It also includes a couple of grab handles on the bow in order to provide you with a support structure in case you manage to catch a fierce one that won't go down without a fight. On top of that, the manufacturers have also supplied this blow-up boat with a bag for fishing tackle, and that is always a nice little addition even if you're already in possession of a couple of those of those yourself. 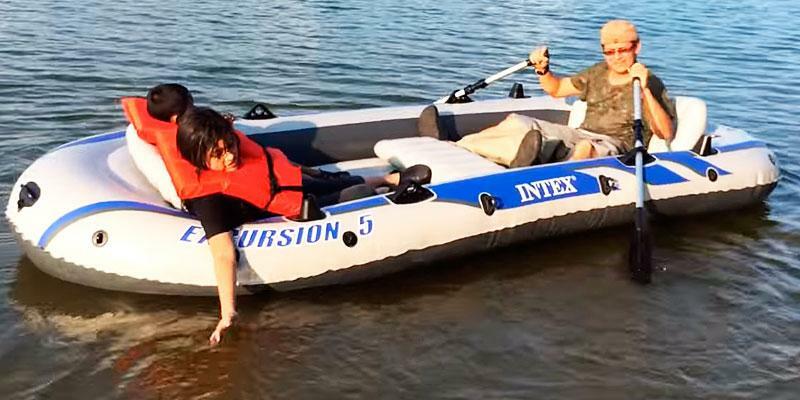 Though, like most inflatable models, this product comes without a motor, the boat does present its users with an option to mount one, so you can easily turn this inflatable raft into a proper motorboat in no time. Naturally, fishing is not the only thing this boat is good for, and there are some elements we would like to talk about that either don't have anything to do with fishing or are as important to other aspects of the entire experience. For instance, the model also comes equipped with a pair of 122 cm French oars that, combined with paddle locks and oar holders, will make the rowing process an absolute breeze. Of course, before you actually start paddling, you will have to get your boat started, and that is where a high-output manual hand pump comes in. With this indispensable tool, it will take you mere moments to inflate a set of Quick-Fill, Fast-Deflate Boston Valves in order to get the boat going. Aside from everything else, the people behind this product also didn't forget to include a gear pouch that will always come in handy whether you're planning a fishing trip or just a simple day at the lake. And that's as good of a place to wrap this review up as any. All in all, the Intex SeaHawk 2 (68347EP) is a 2-man inflatable boat that, despite this little limitation, is arguably one of the best options on the market if you're looking for a reliable model to go fishing with your partner or simply enjoy a nice day at the lake. Have you ever think about making a "boat party"? 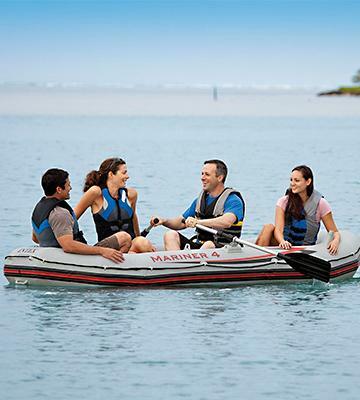 This boat has excellent features that allow you to use it for recreation with a small group of friends! A pretty impressive length and width let you place a group of 4-5 people and a lot of different fishing tackles or other essentials. To be more precise, the boat can load about 1000 pounds! 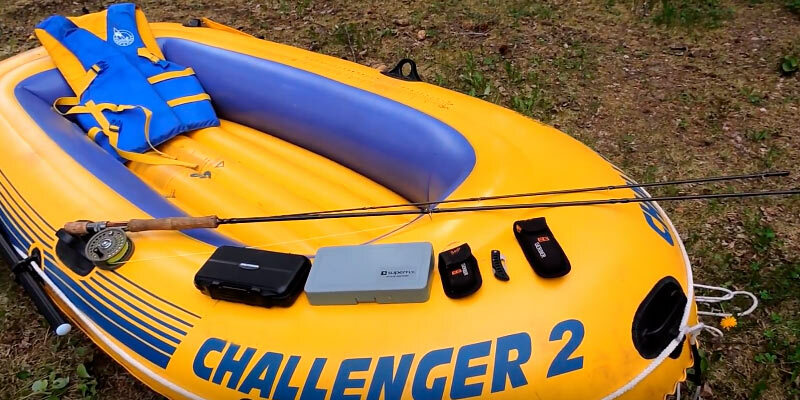 So, you can use this boat for a variety of different tasks on a lake or river. You, your family and friends will fall in love with this model without any doubt! Despite huge dimensions, this inflatable is extremely safe! Intex Excursion 5, as most models of this class, has three chambers. One chamber is an inflatable bottom that can be inflated with a standard valve, which allows you to inflate it even without a pump. Two others are the inner and outer chamber of the sides. Hence, such a design allows the boat to stay safe in water even if it is punctured. Finally, if you would like to go fast and change the place of fishing quickly, you can install a small motor on this model. 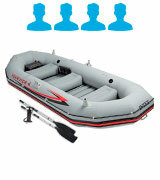 We are sure that you will like this rubber boat after the first minutes of use! You will enjoy this rubber dinghy! The boat features 4 fishing holders which are located in every corner of the boat and two inflatable seats with backrests. So, four fishermen (and one observer) can enjoy the fishing process in this super boat. Furthermore, if you feal that you do not have enough space, you can easily remove all the seats for a free organisation of inner space. The kit includes two 54" oars which can be placed in the special oarlocks. Note that a pump and a repair kit are already included. 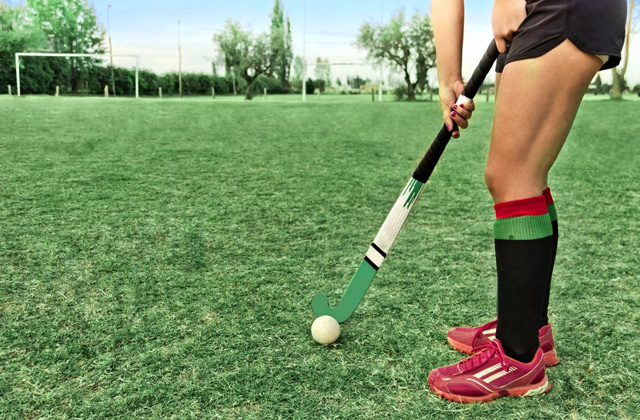 For convenient storage of the gear, you can find a special pouch that lets you have all essentials within easy reach. To sum up, this boat is absolutely worth every penny! 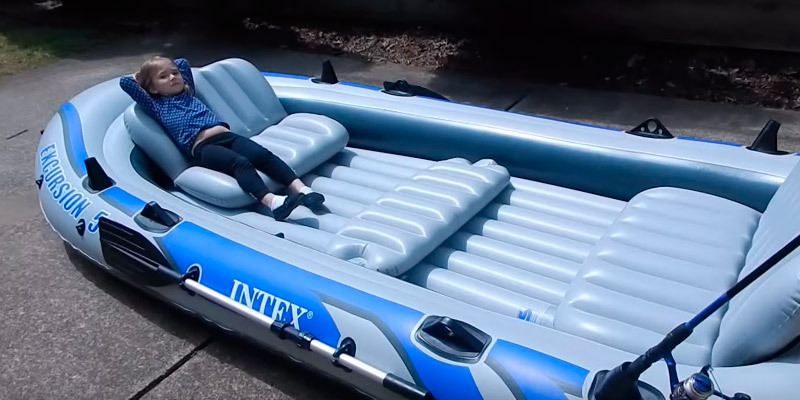 Even though Intex is a company behind an array of different rafts and boats, sometimes even a team of experts may decide to experience with a different approach and the model in question is as good of an example of that as any. 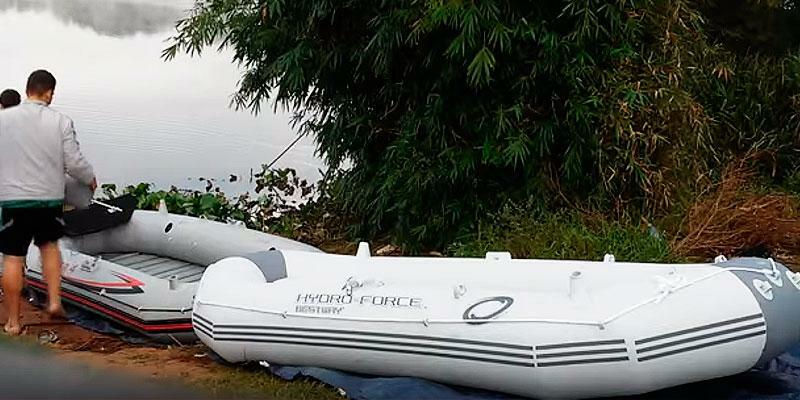 What we have here is another 2-man inflatable boat from Intex that may look somewhat similar on the first glance but, upon further inspection, it wouldn't take a specialist to tell that this is a bit of a different option and a different turn that the manufacturers have clearly taken in the process of designing this interesting product. The biggest "turn", so to say, was to rid the boat of everything that isn't necessary in order to bring the dimensions and the weight of the product to an absolute minimum and to make the product as convenient and manoeuvrable as possible. And, without further rhetoric, it does seem like the experts behind the Intex Challenger 2 (68367EP) have certainly managed to successfully pull this goal off, given the fairly compact 114 x 236 centimetres of overall dimensions and an almost unprecedented 7 kilograms of weight. It is the latter that will allow you to take this boat with you on a camping trip without ever even noticing that it is there in the first place, not before you actually start inflating it up. As you might imagine, this kind of minimalistic approach would entail certain downsides as well, but it is in the eyes of the beholder to decide whether these elements are disadvantages or they're just aspects designed for a more specific purpose. 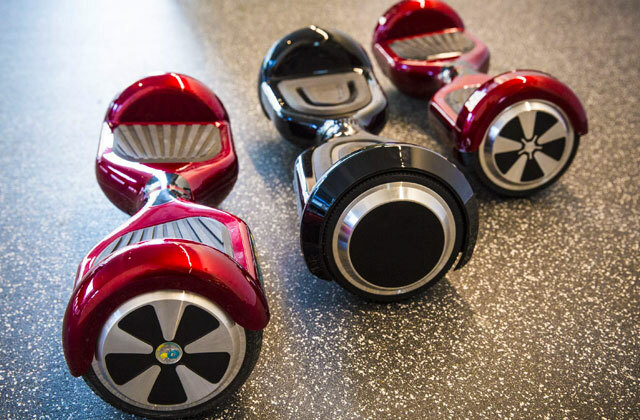 For instance, the model's structure means that it will only be able to hold up to 170 kilograms of weight. On top of that, it doesn't include any fishing rod holders, so you may certainly arrive at the conclusion that this isn't really the best fishing option, especially if you and most of your fishing buddies aren't particularly the skinniest people in the world. 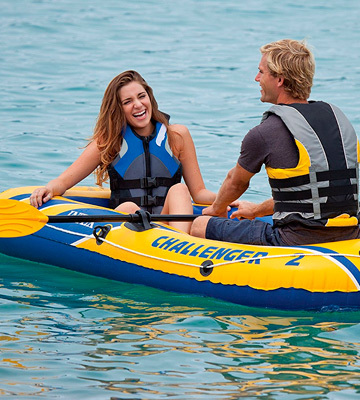 But you could say that these cutbacks were necessary in order to create a great excursion inflatable boat for you and your significant other to enjoy a day at the lake without any distractions that could easily arise with some of these features getting in the way. And that is exactly with this purpose in mind where the model truly shines, especially given the extra firm vinyl construction that is resistant to gasoline, oil, and salt water. While, due to its weight limit, this product wouldn't fit someone looking for a fishing boat for himself and his partner, nothing is stopping you from using this lightweight model for some solo fishing experience. 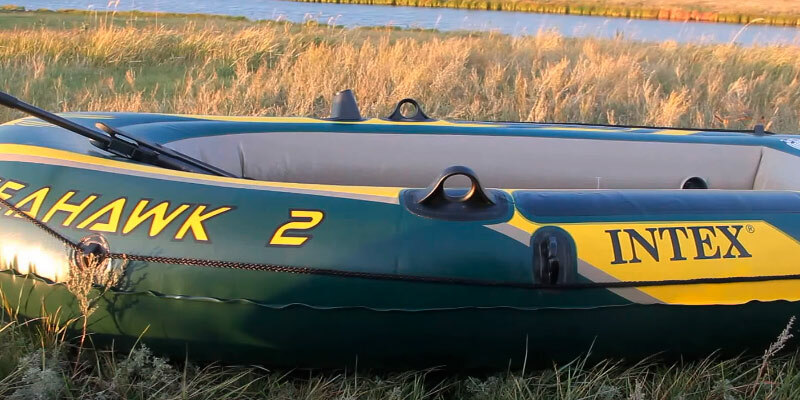 As we have already established, this inflatable dinghy was specifically designed for intensive use and is resistant to wear, bumping, and sunlight, and any experienced fisherman would tell you that these things are far more important than certain conveniences you may find in other models. It also comes with a bag for fishing tackle and a safety rope around the entire perimeter, so you won't have to worry about a particularly feisty catch dragging you down to the water. 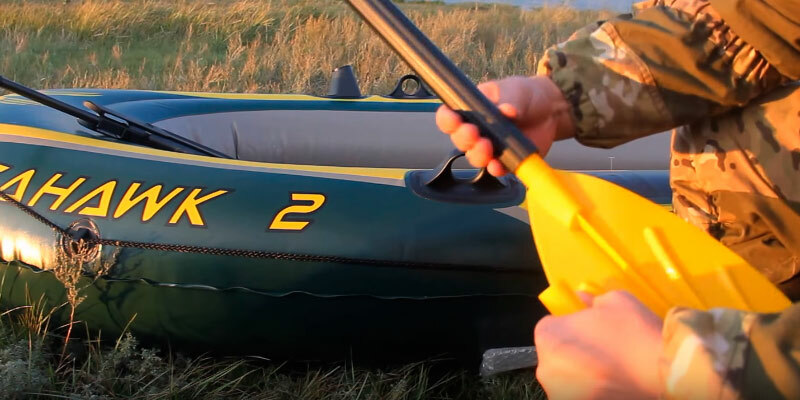 Aside from that, the model comes equipped with everything you would want out of an inflatable boat, like a pair of aluminium oars, paddle holders, or a high-output pump. 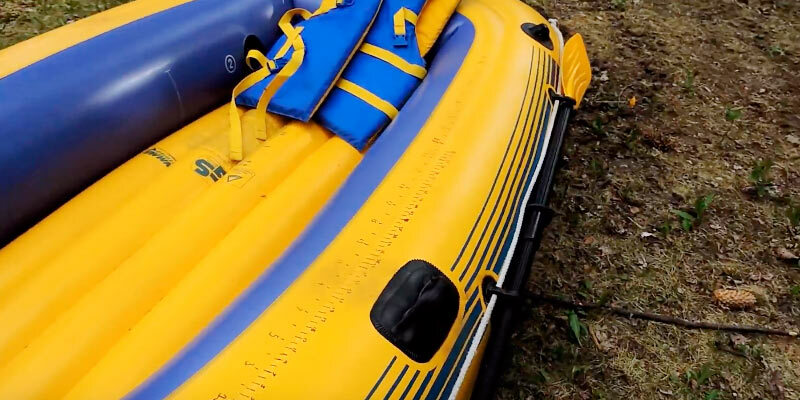 In addition to three regular air chambers, this boat also incorporates an extra inner air chamber for improved floating capacity and an inflatable bottom. And that, among other things, is precisely why the Intex Challenger 2 (68367EP) ought to pique your interest. Though the model is incredibly lightweight, it is also one of the most durable and reliable inflatable boats out there. That, combined with the price tag it comes with, is what makes this product such an alluring option for a variety of customers. If you love spending time on the water with your friends or family, this review is just what you need! Now the market is full of different inflatable boats. Why are they so popular? A secret is that they are extremely portable, light, easy to maintain, and can be inflated just in a matter of minutes. All you have to do is unfold, pump it up, and launch! 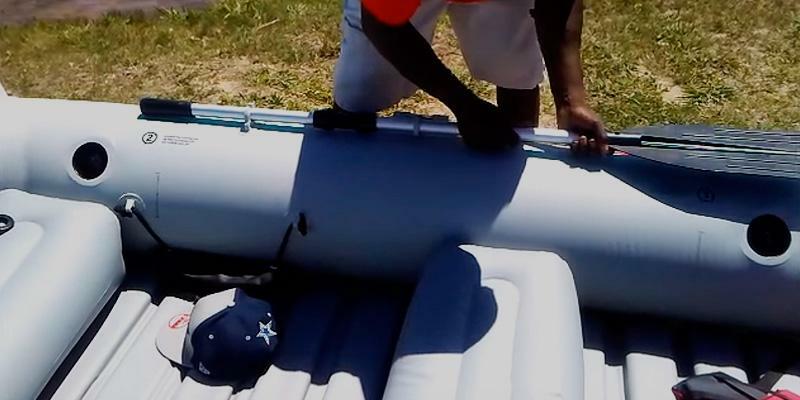 An inflatable boat gets its buoyancy from pressurized air in its chambers. 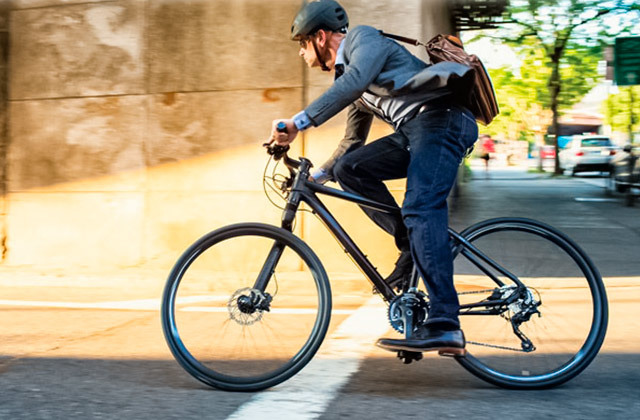 Certainly, they boast some more advantages: pretty good buoyancy, portability, and innate dynamic stability. But how to choose the best one? There is no "the best boat" but for sure there is a "the best boat for you". 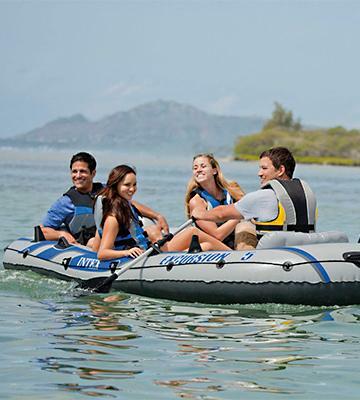 So, before choosing the inflatable boat, you need to know a few things. If you're an avid fisherman, there are a few more products that should definitely be added to your arsenal. One of them, obviously, is a fishing rod, and another one is a fish finder, a device that will help you detect fish by scanning the bottom relief. 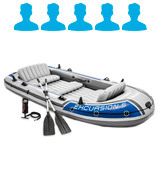 The first thing you need to decide while choosing an inflatable boat is how many people and where will use it. After you decide, you will be able to choose the proper size and capacity of the boat. If you are going to use it for fishing on a lake with your friend or son, it is better to choose the boat with the capacity around 600-700 pounds. This option is optimal both in size and usability. 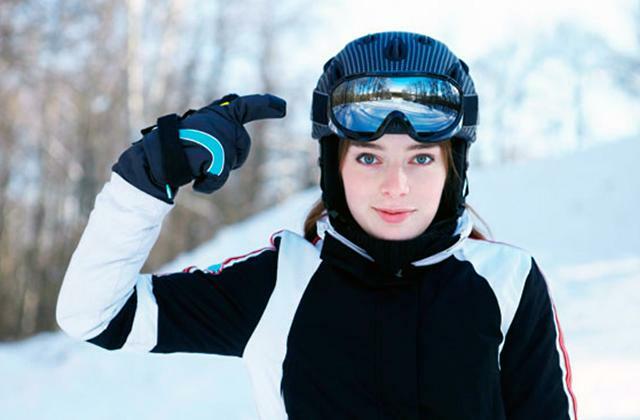 But if you search the one for recreation with your family, you need to choose the model which can load around 800-900 pounds with 9-foot length. Large boats that are longer than 12 feet allow you to take on board more than 1,000 pounds, which is great for big friendly companies. Once you have decided on the capacity of your boat, do not forget to check the design peculiarities. Pay attention to the number of inflatable chambers, the bottom, and valves. 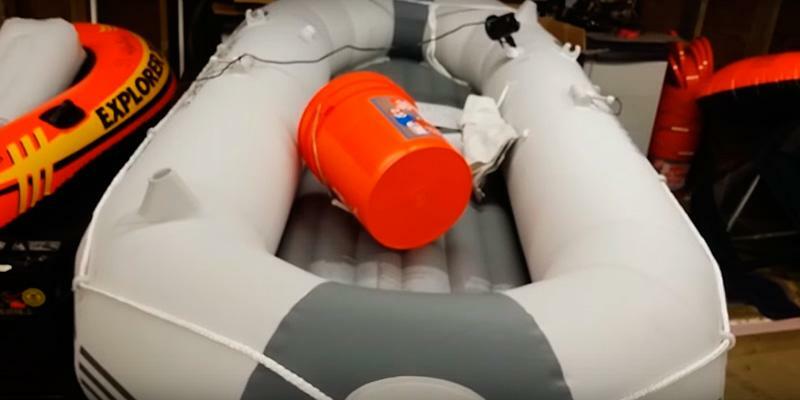 The more inflatable chambers are in the boat, the higher is its reliability since if one chamber is damaged, the others will be able to hold the load without any problems. If the floor of the boat is made of plastic, wood or aluminium, it will be much easier to stand up inside the boat on the water. The point is that the bottom will not sag under the feet, and you will be able to fish with your spinning. The speed of inflation or deflation will depend on the valves type. 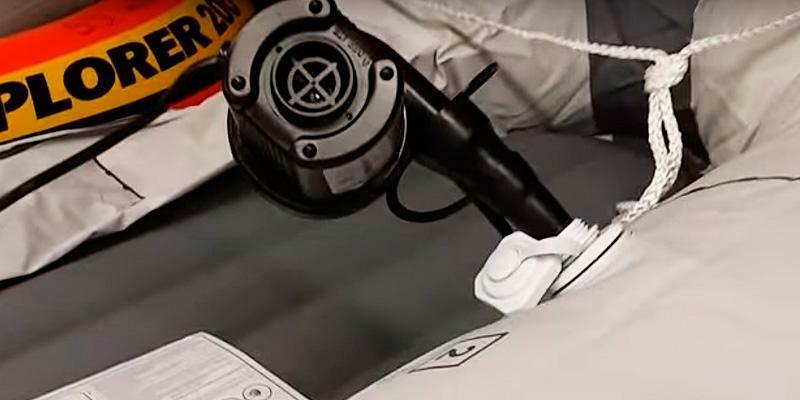 For example, two Boston valves can help quickly inflate the boat and won't deflate even if the lid accidentally opens. Also, you need to take into the account the possibility of installing the motor which will let you move much faster. Since the boat is designed for the rest, its usability is of great importance, too. Some extras can dramatically improve the comfort. For example, the big number of inflatable seats allows you to accommodate your family or friends comfortably, and the possibility of rearranging the seats lets you organize the space inside the boat. Swivel oarlocks for oars ensure a comfortable control of the boat. What's more, by using the rods stands, you can free up your hands while fishing. Special bags or compartments for fishing tackle allows you to keep all your essentials at hand. 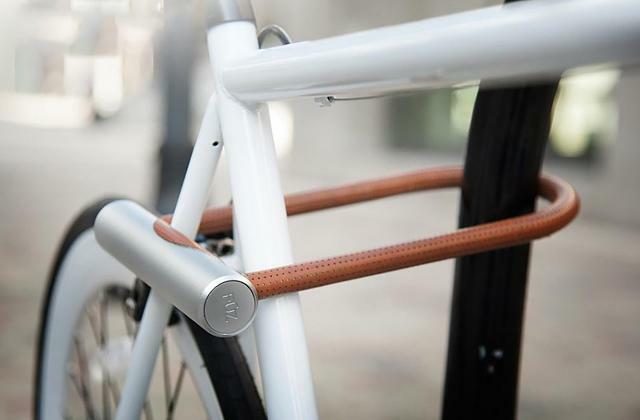 The handles and light weight make transportation quick and easy. Also, pay attention to the packaging: as a rule, it includes oars, storage case, pump, and repair kit. 1. Alex Smith Choosing the Perfect Inflatable Boat, Boats.com. May 13, 2015. 2. 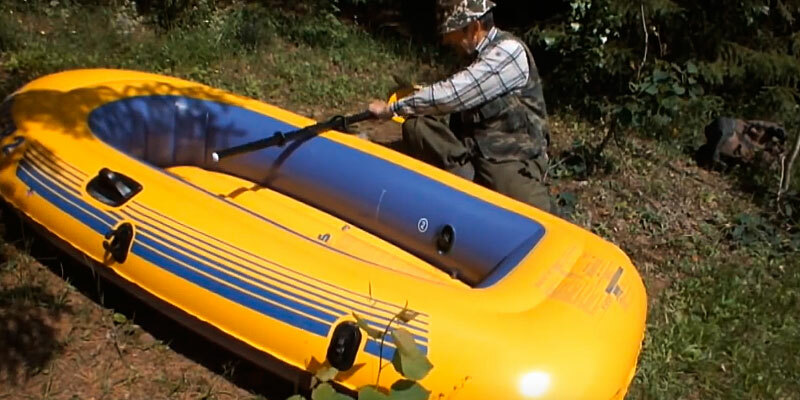 How to Choose, Use, and Maintain an Inflatable Boat, wikiHow. 3. Jodi Thornton O'Connell How to Repair an Inflatable PVC Boat, eHow. 4. 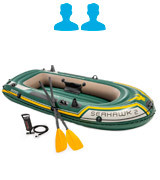 How to Clean an Inflatable Boat, eBay. September 19, 2015.